A listed, village castle on an estate with 3 continuous hectares in Gascony - chateaux for sale France - in South-West, Perigord, Dordogne, Quercy, Limousin - Patrice Besse Castles and Mansions of France is a Paris based real-estate agency specialised in the sale of Castles / chateaux. 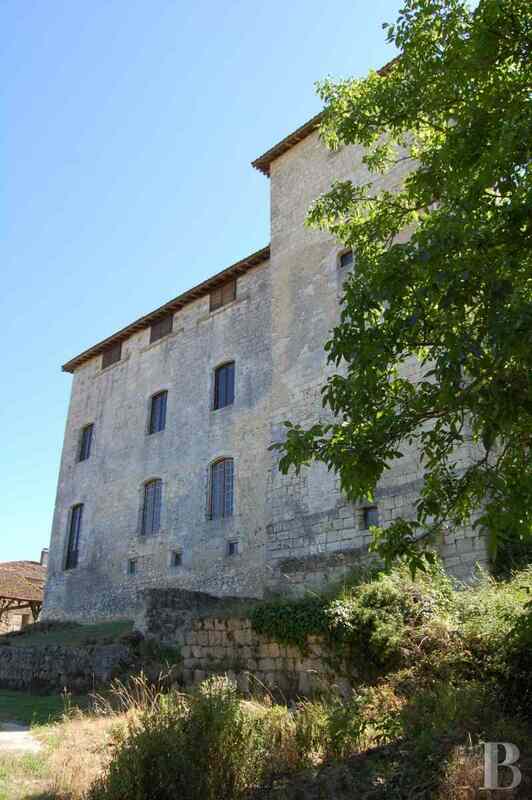 In the north of the French department of Gers, some 40 minutes from Agen (TGV train station, A62-E72 motorway) and 10 minutes from an old bastide or fortified town with all shops and schools. 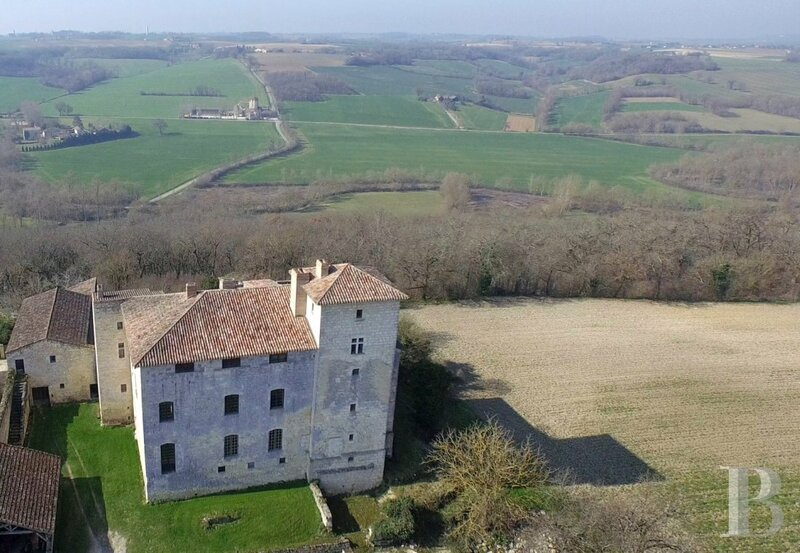 This Gascony castle, on the outskirts of a hamlet, overlooks the fields, woods, hedges and copses that form the undulating Lomagne countryside. Toulouse is 70 minutes away (TGV train station, international airport). This castle is perched on a hill overlooking a valley. With the village on its south-east side, it is set in grounds of almost three hectares spread out on its north-west and north-east sides, the south-west side looking out over a sheer cliff. 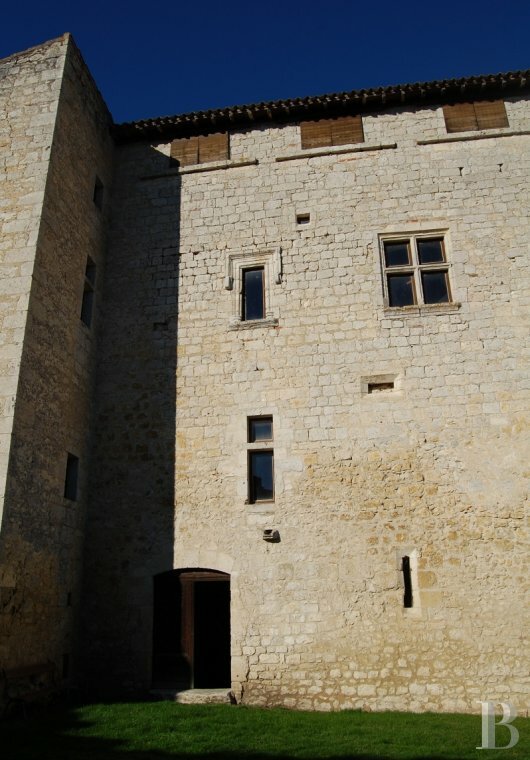 An annex building, spanning 75 m², and a covered area, spanning 40 m², on its south-east side separate the castle from the village. There is therefore an unobstructed, nuisance-free view taking in the countryside in three directions as of the ground floor. 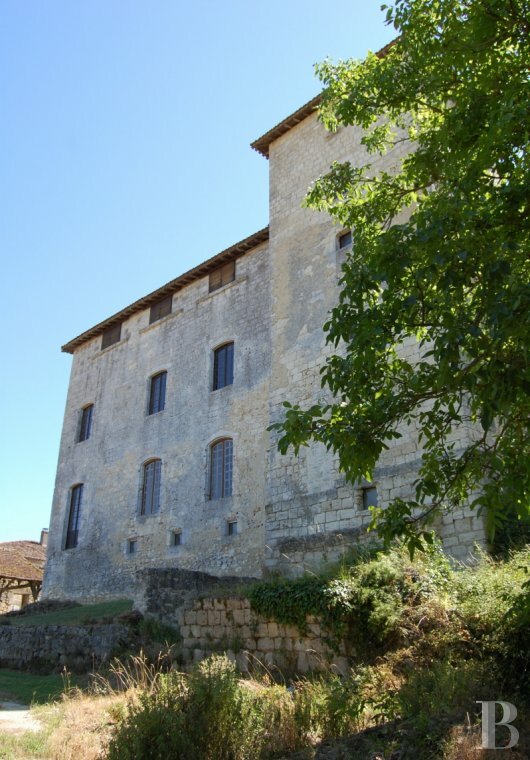 Constructed at the beginning of the 13th century, this building is a good example of Gascony’s regional style. It then predominantly comprised a keep, or “sala”, with very thick walls built over a vaulted cellar, all of which highlighted its defensive vocation. 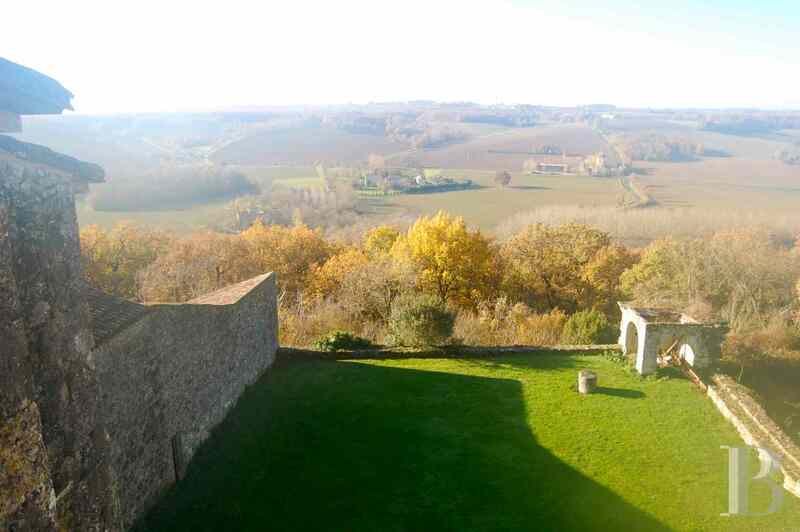 The viscounts of Lomagne were some of the owners of this castle as was the Larroquan family. 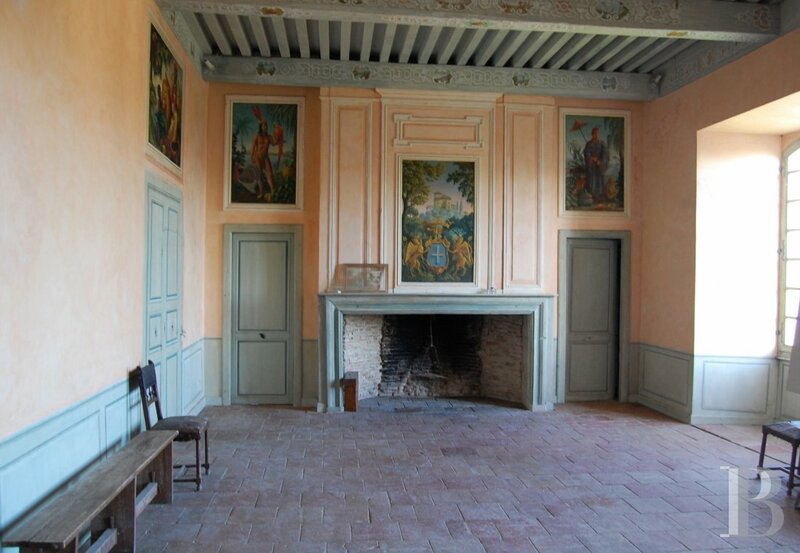 The residence was purchased by sharecroppers at the time of the French Revolution. The architecture, originally austere because of the building’s military function, became less forbidding in the 16th century with the addition of several openings. But its structure was not to be greatly redesigned until the beginning of the 17th century when an extension was added on the west side with its living quarters and a large, so-called courtroom, featuring tall, wide windows and painted panelling. 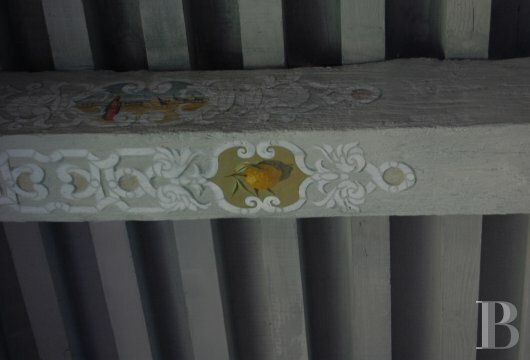 It is still possible to appreciate large sections of the remaining murals with foliated scrolls in one of the rooms on the third level. 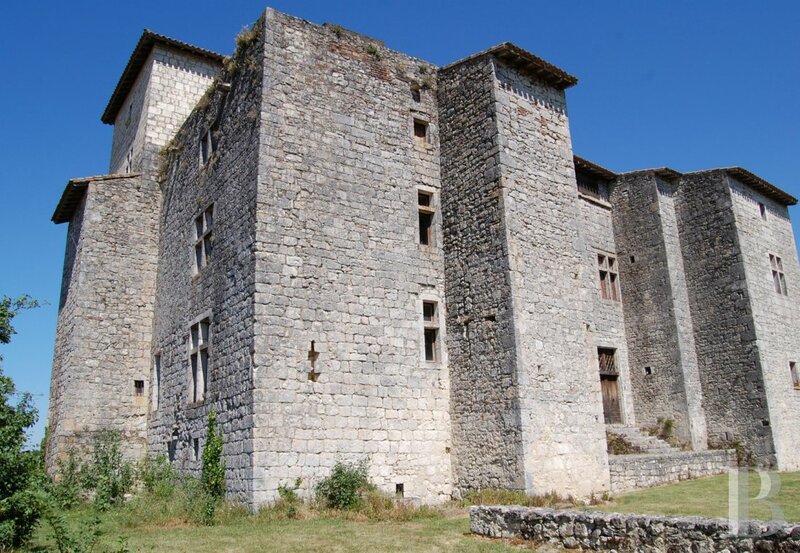 This castle spans four levels including a basement and an attic floor. Its architecture is notably characterised by two axes of symmetry: one corresponding to the median line along the south-west and north-east facades; the other diagonally opposed north-west/south-east axis featuring a tower at each of its ends. Said towers house bedrooms on each level. Each of these cosy bedrooms has a fireplace, in good working order, and all are pleasantly illuminated via daylight, coming from two different directions. 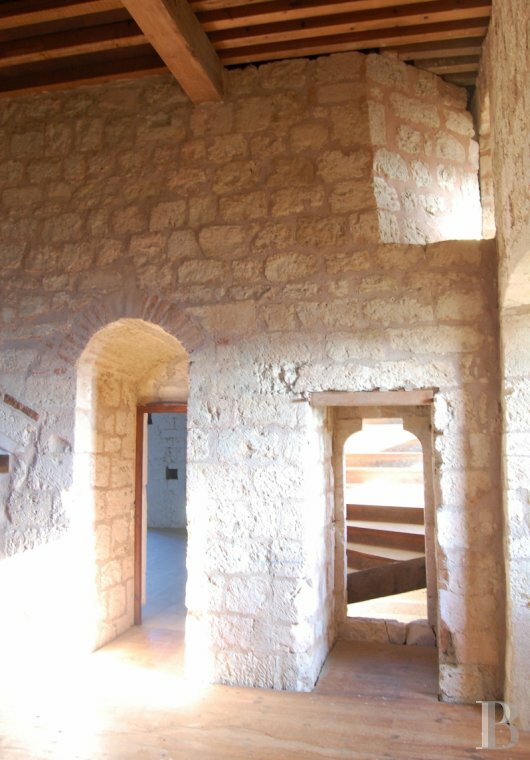 Two entrances provide access inside the building: the oldest one, in the lower sections, opens into what was the guard room in the Middle-Ages; the other is on the south-west facade, facing the valley. The first floor, reached via a few steps, is above the south-west esplanade. 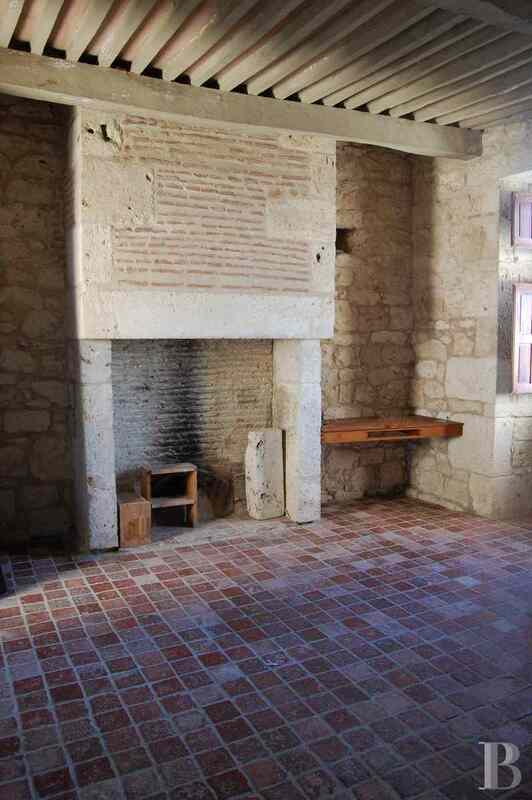 It corresponds to what was called the “noble” floor in the 18th century. This floor includes a large stateroom, currently with monochrome painted panelling and doors. 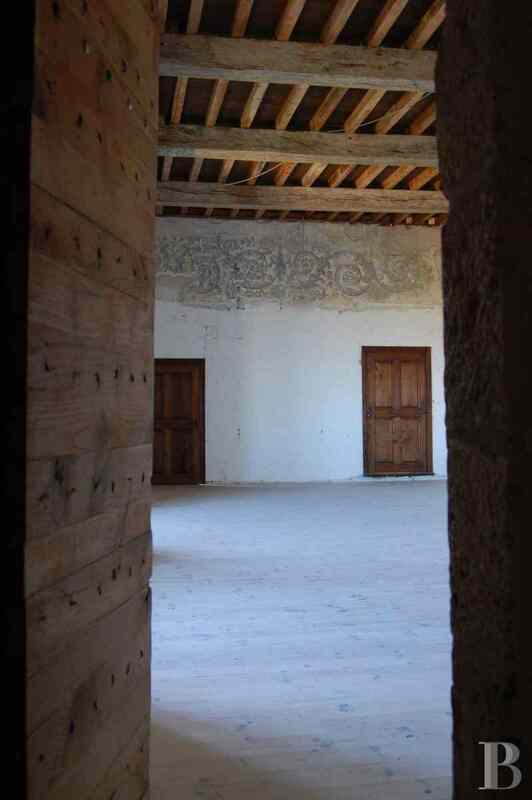 The scrolls above the doors are modern reproductions as is the polychrome decoration on the beams. The layout on the first and second floors is identical, differentiated only by their decorative styles more or less resembling those of the seventeenth and eighteenth centuries. 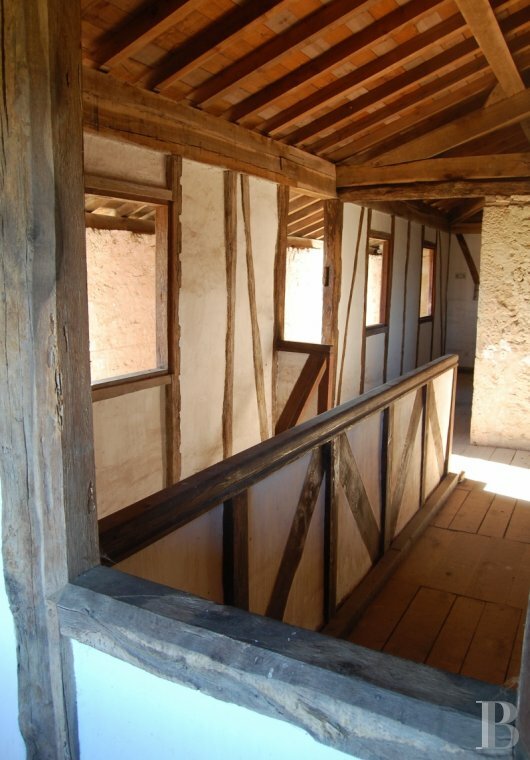 The third floor, probably levelled off at the time of the French Revolution, was largely reconstituted in recent times in accordance with old masonry and carpentry trade practices. The aim was to recreate the top floor of a castle from the Middle-Ages: wooden galleries with a wall-walk. The layout is therefore that of an attic divided down the middle by a partition of pillars, cross-braces and rendered masonry filler. 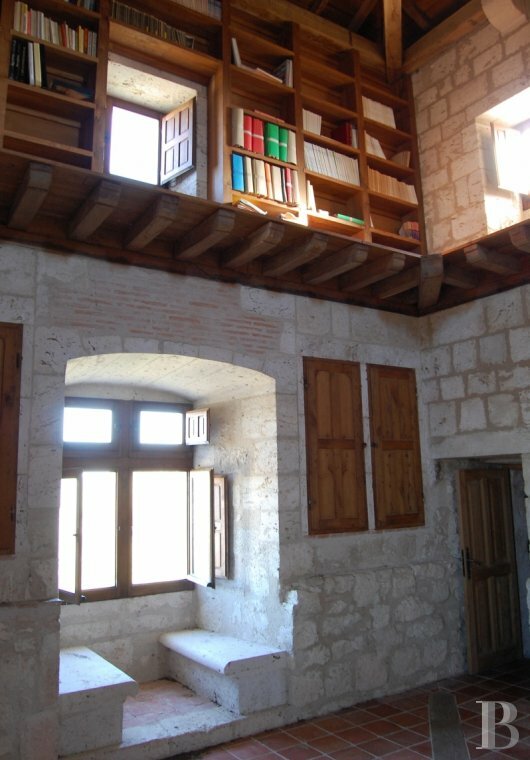 The upper section of the keep has been converted into a library. With its fireplace and roofing framework, featuring horizontal framing with a single tie beam and truss lock plates, light comes in on three sides. Window seats have been set in the thickness of the walls. The layout of this floor defines that of the following two. Each meets the same structural principle characterised by two axes: one median, the other diagonal. The median, east-west axis provides two large areas; the diagonal, south-east/north-west axis is marked by two towers, one of which is the keep. 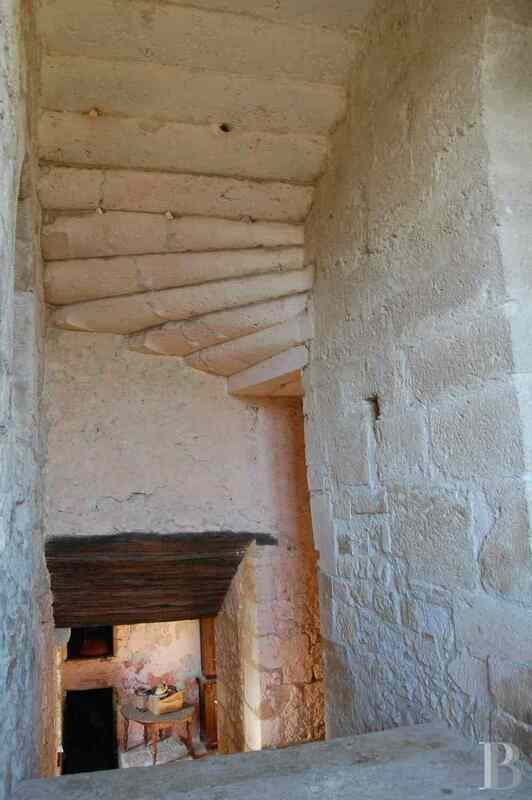 On the basement level, the base of the towers houses two cellars. The deeper one, under the keep, has always been a wine cellar, as is proved by the stone barrel supports that are still in existence. The median division provides this level with an entrance hall on the south-east side, housing a stairway. 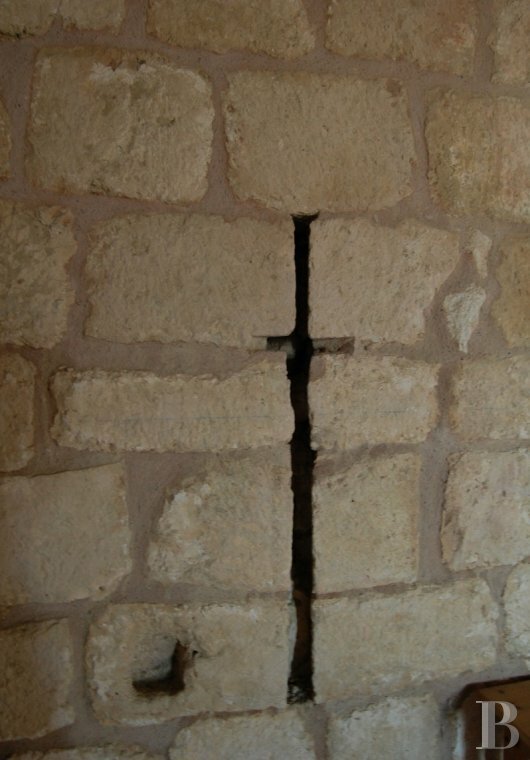 This precedes what was a storeroom with grain silos hewn in the rock. 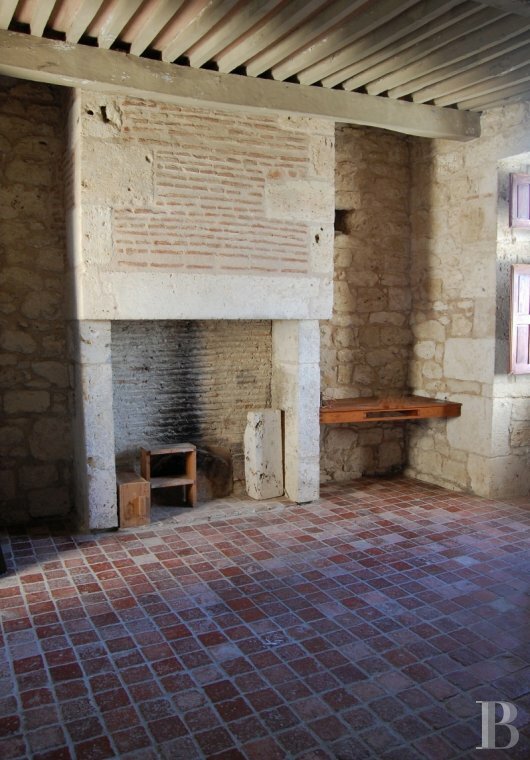 On the north-east side is the old kitchen, the so-called guard room, with its two fireplaces; one set against the median wall and the other set at right angles, against the north-west partition wall, next to the base of the keep. 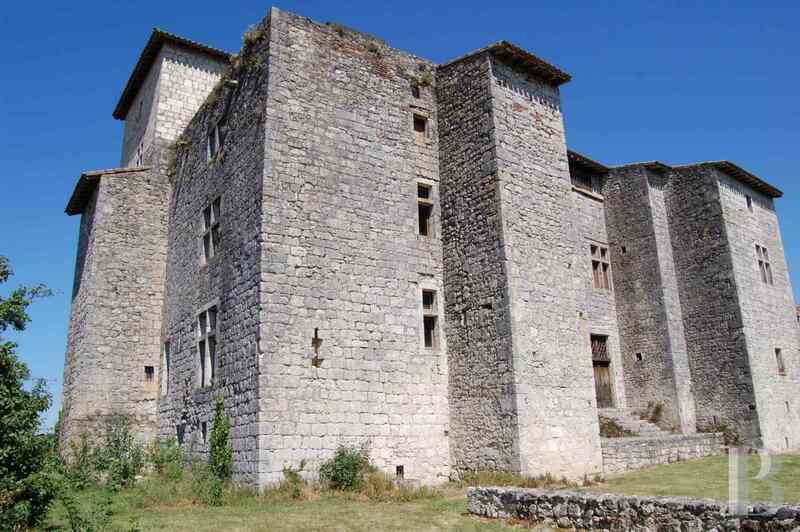 In addition, on the north-west side adjoining the primitive structure, is a south-west/north-east extension of the castle which was built in the 16th century. 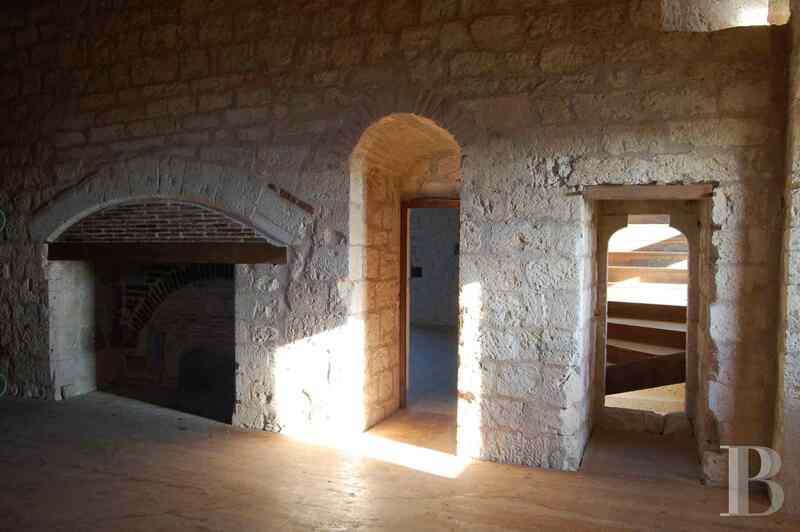 This houses a vaulted cellar in use as a bar. It opens into the wine cellar below. 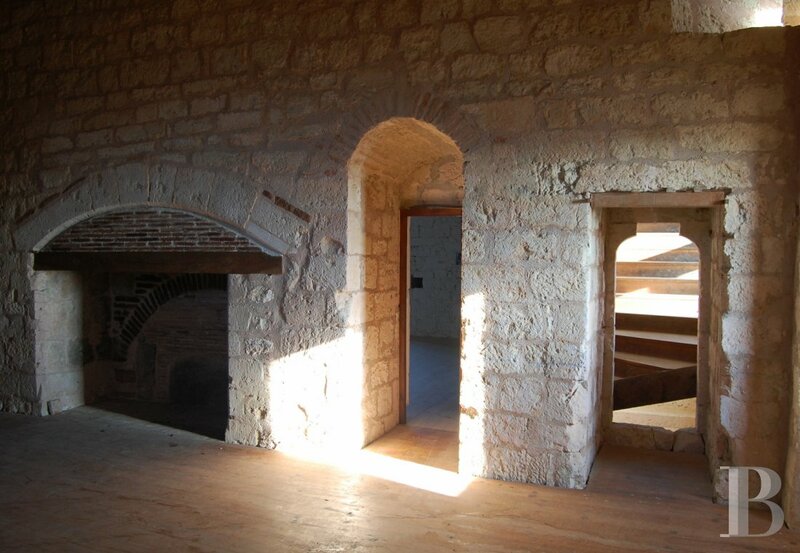 Except for the wine cellar, all sections are illuminated via basement windows or via the entrance door. 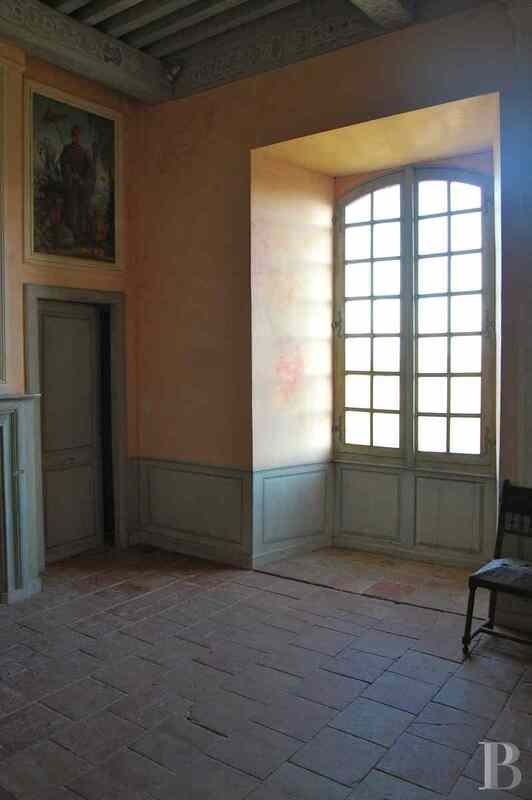 A second entrance door opens into an anteroom which provides direct access to the old kitchen. 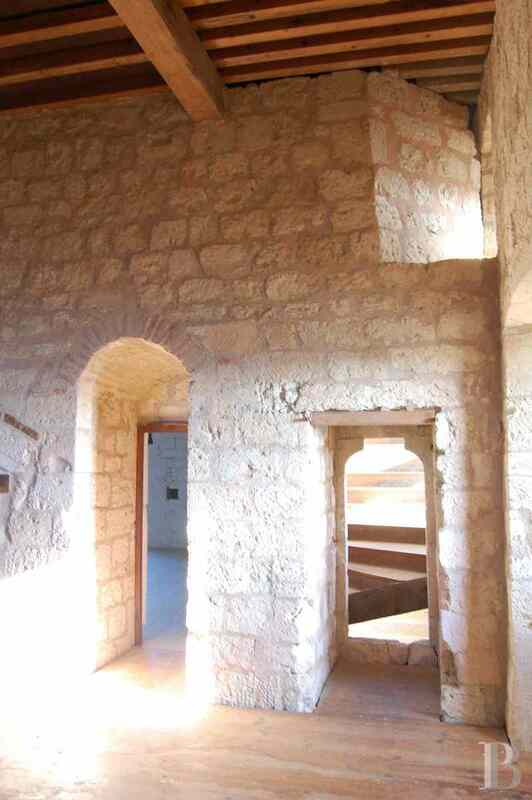 The ground floor can be reached in one of two ways; either via double doors opening on to a terrace, laid out on the south-west facade and looking out over the valley below, or via a large indoor stairway. 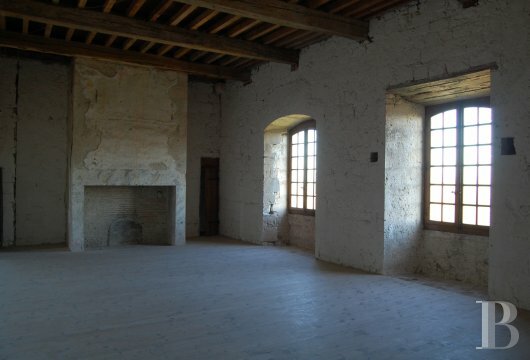 Both means provide access to a large reception area (41 m² and 48 m²), the bigger of which on the north-east facade was given large windows in the early 17th century. 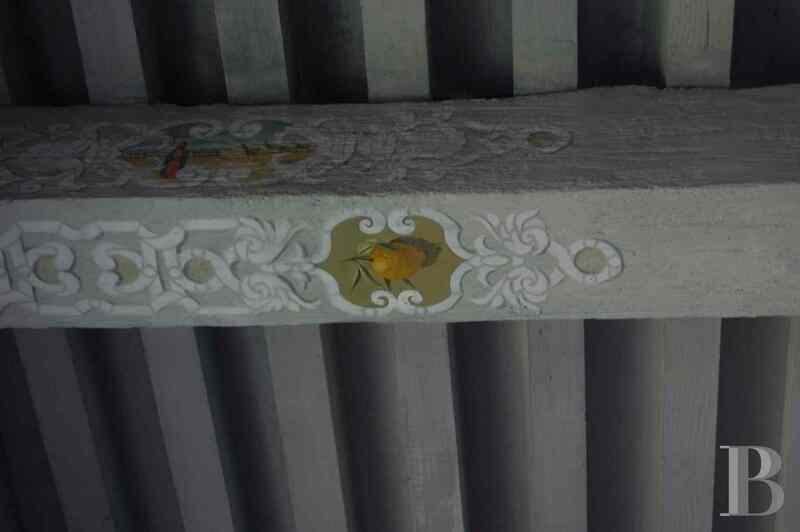 Its features include monochrome painted panelling, door trumeaux and polychrome decoration on the beams. These two staterooms communicate via a concealed door. 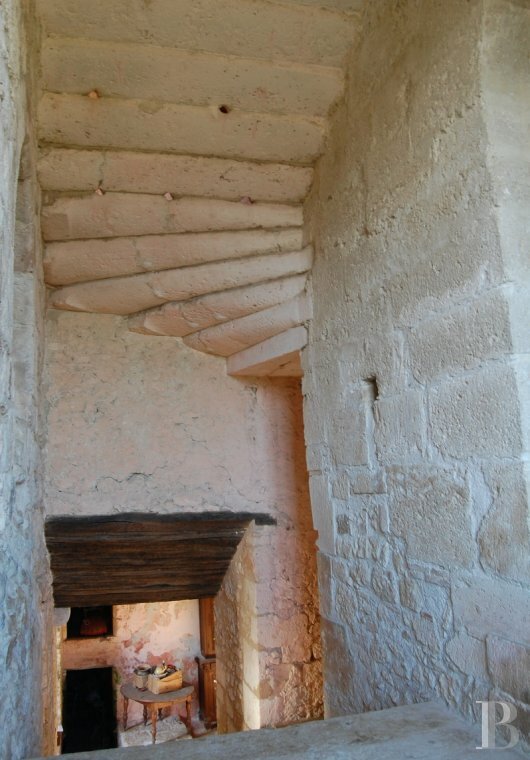 The decorated one opens into a bedroom in the keep (22 m²) with a toilet in a watch-tower. This bedroom communicates with a stateroom (41 m²) laid out in the north-west extension, added in the 16th century. A recent kitchen (23 m²) communicates with the stateroom on the south-west side. A shower room with a toilet has been installed in a watch-tower (6 m²). The illumination changes depending on the facade. 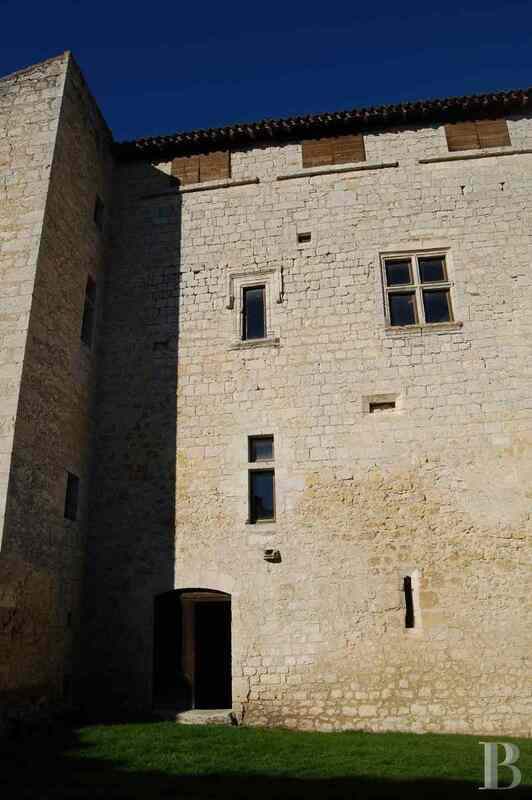 The biggest openings are on the north-east side, the smallest on the south-west side, protected on the outside by the shade of the buttresses, used as a watch-tower. And yet, the light here is extremely pleasant and not dim as might be expected. 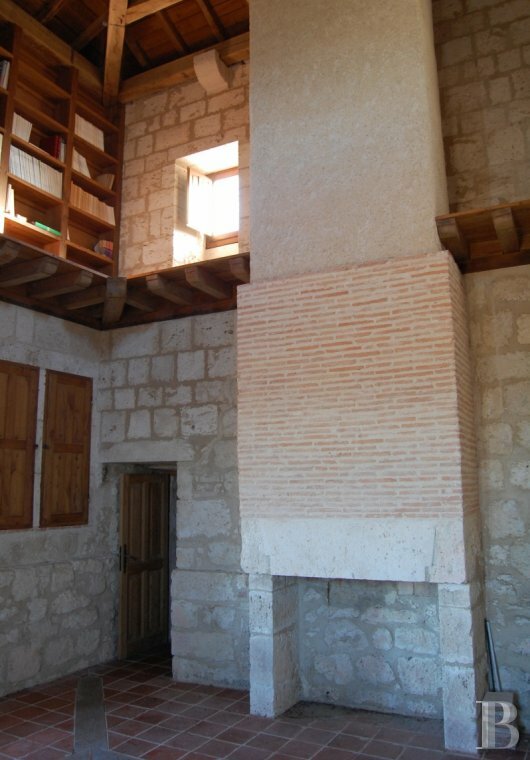 A bedroom (22 m²) with a fireplace, on the north-east corner, faces south-west and north-east. The first floor is laid out in the same way as the ground floor with just a few differences. 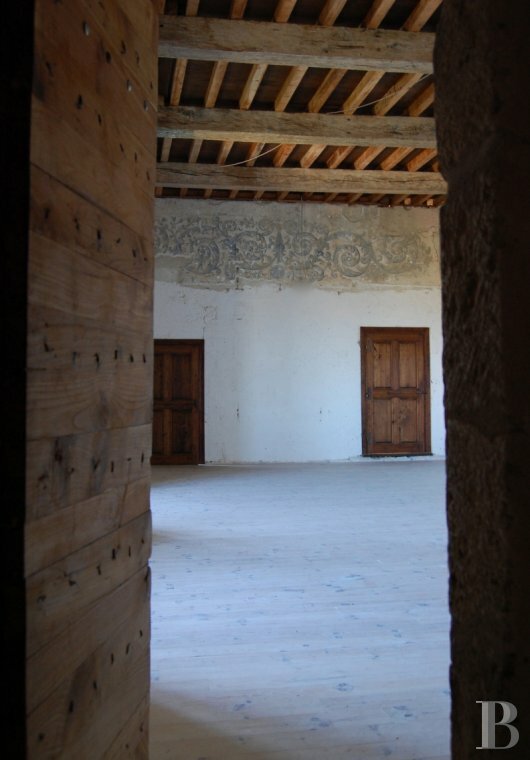 For instance, a large stateroom which still has foliated scroll decoration dating from the early 17th century on the north-east side (70 m²), also has large, arched openings. 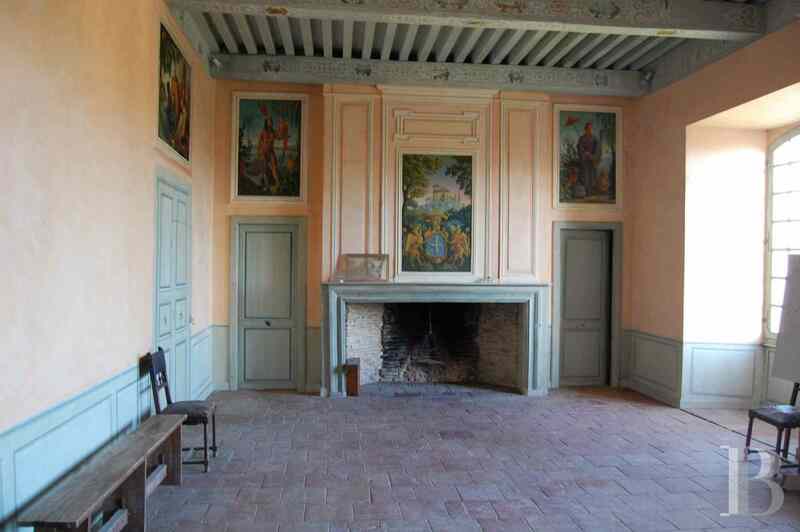 It features a fireplace, the decoration of which still awaits completion (since the 17th century). 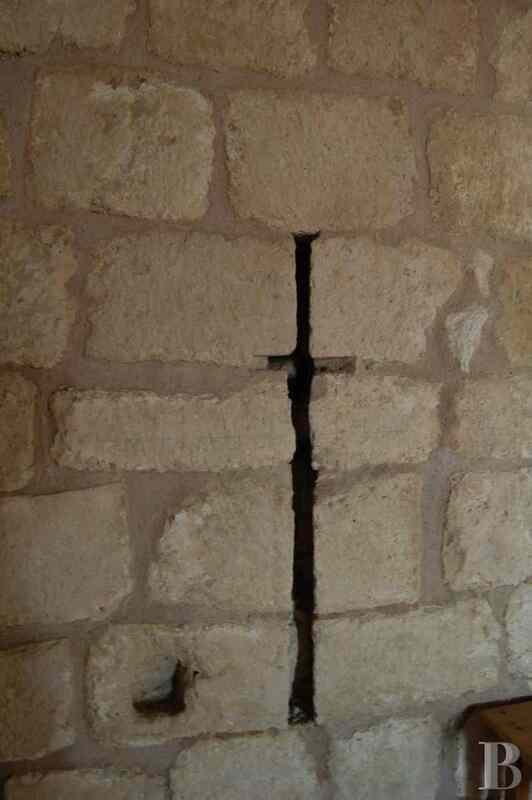 Traces of black stone are visible in places whilst the beginnings of imitation marble can also be seen here and there. This stateroom opens into a bedroom (21 m²) with a toilet in the keep. 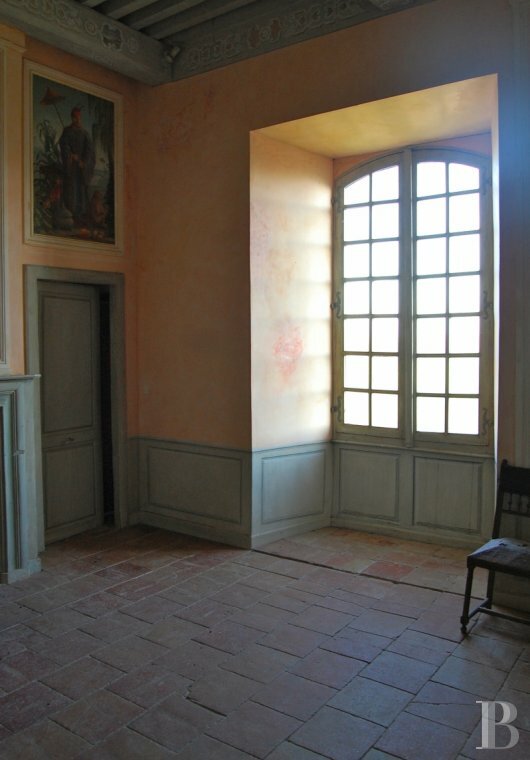 Said bedroom communicates with a stateroom (46 m²) in the 16th century extension. On the south-west side is a stateroom (69 m²) which was once partitioned as is the case for the room on the south-west side and the kitchen on the ground floor. 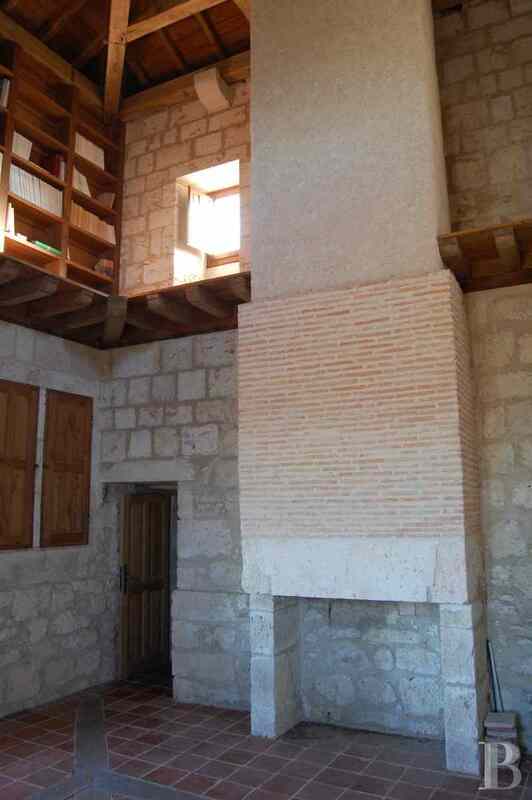 An additional fireplace bears witness to the removal of this wall. Once again, a shower room with a toilet (6 m²) has been installed in the same manner as on the floor below. 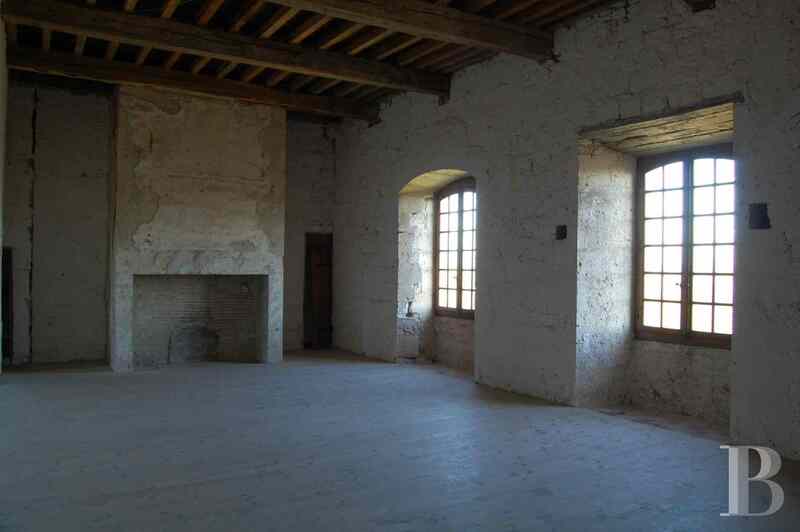 The top floor under the rafters, as well as the top of the keep, have been partially reconstituted, the top floor of the keep having been levelled off during the French Revolution to stop it being higher than the ridge of the dwelling. A brand new roof has been constructed which rests, not on the load-bearing walls, but on a roofing framework vertically supported on the masonry in order to prevent the facade walls from bulging. The entire building is therefore amazingly robust. The top floor of the keep has been converted into a vast central section, also divided along its median axis into two areas (71 m² and 66 m²), and surrounded by a wall-walk, featuring openings that can be blocked by sliding shutters. 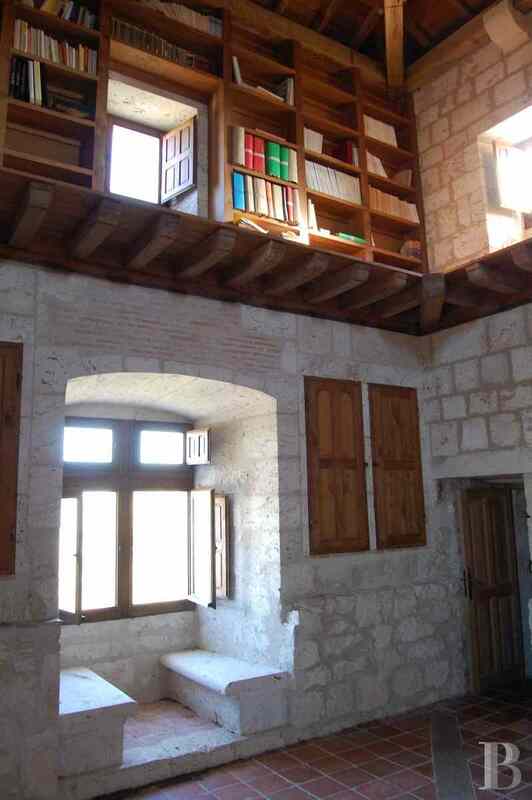 A stateroom on a lower level, on the top floor of the extension (48 m²), two bedrooms (21 m² and 19 m²) as well as a comfortable library (25 m²) with openings on three sides, complete this level. Each room has a fireplace. 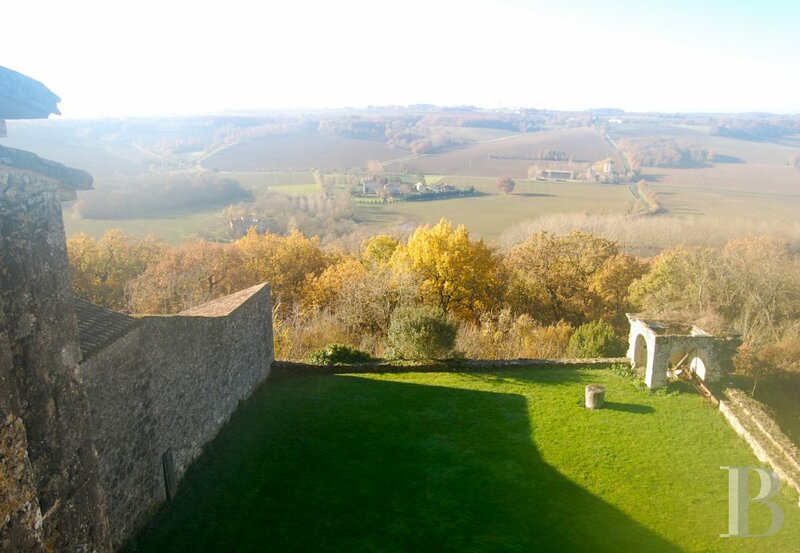 Although the view from the library looks out to the south-west, the north-west and the north-east, that from the section surrounded by the wall-walk looks out to the north-east, the south-east and the south-west. The Roman tile roof is completely new and in pristine condition. The beams in the stateroom (48 m²) and bedroom no.5 are 2.35 m high, whilst those in the library, with its horizontal roofing framework, are 5.96 m high. The ceilings in the state rooms and the ridge in the attic space are 4.9 m high. A stable, spanning 79 m² with a 3.96 m high vault, constitutes the main outbuilding. An attic, in use as a workshop, can be reached via an outside stairway. The effective floor surface area of the upper section spans 40 m². Backing on to a wall running alongside a little access street, is a farm shed (40 m²). It is open on three sides and has a Roman tile roof. The road leading up to the castle is steep. A feeling of austerity initially dominates the first impression: separated from the village by a long building, the castle appears isolated on the edge of two worlds. And therein lies its charm linked to the surprise of discovering an almost baroque scenography with a 360° view of the surrounding countryside. A different impression comes from the inside of the house, which vibrates with bright light, highly controlled in its effects. The Age of Reason knew how to instil another vision of the world in this ancient building, without losing its character. There is nothing more astonishing than the way the shadow plays on the stairway or around the bend of a short corridor. Said Age of Reason has donated its own character, one of grace. Our contemporaries now have the chance to continue the work that was started eight hundred years ago, this vast conversion potential giving free rein to their imagination.